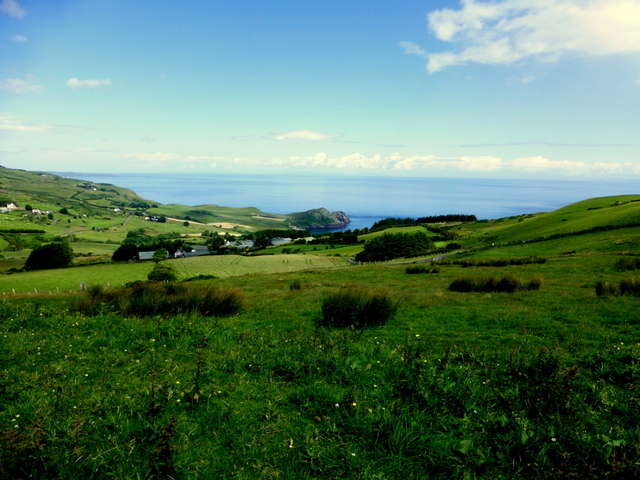 Torr, County Antrim – image © copyright Kenneth Allen. Andrew Harper was born around 1810 in Templepatrick Antrim Ireland and was christened on 14 Jun 1810. On 23 Dec 1834 he married Maria Gleghorn. (ref Ancestry.com 7 Nov 2006). On 11 Aug 1841 Andrew along with his wife Maria and three young children boarded the Marquis of Bute in Greenock Scotland bound for Port Phillip Bay New South Wales as assisted passengers. They arrived on 30 Nov 1841 with their children Paul 6, Samuel 4, and Henry aged 9 months. What a big decision it must have been for Andrew and Maria when they decided to take their chances on starting a new life in the Colonies. Bearing in mind that Batman and Fawkner had first settled Melbourne in 1835 it must have been one hell of a gamble. It was only 4 years earlier in 1837 that Governor Darling on a visit from Sydney to the “New Settlement” named Melbourne. It was a courageous decision to make. The Voyage to Australia took three and a half months and was not easy. The trip was listed as a very severe passage with head winds for the greater part of the journey (Ref: page 80 Perilous Voyages to the New Land by Michael Cannon). There were 3 births and 8 deaths (the deaths were principally children). On arrival in Port Phillip Bay 4 women and a man were still suffering from Typhoid Fever and the ship was placed in quarantine some distance off shore. While in quarantine passengers complained of sailors “mixing with the female immigrants” which was later denied. In all there were 227 passengers, 179 being protestants and 48 catholics. Of the adults 124 could read and write, 22 could read only and 15 were capable of neither a total of 161 adults. The Harpers where shown on the ships logs as protestants,(religion was considered important on all documents in those days) The bounty was for 2 Adults at 9 pounds, 2 children at 5 pounds and an infant. Andrew was listed as a labourer. A further 5 children were born after their arrival, 3 surviving into adulthood. After her birth another child Elizabeth Hannah is recorded as being born in Newtown Geelong Victoria in 1846. Following the two girls a son John Phillip is recorded having been born also in Geelong in 1847. He is followed by William James who was born at Taylors River in 1850 and died in Geelong in 1853. No record has been found for the cause of death. Taylors River does not appear on any of today’s maps and is assumed to have been a location in the Geelong area where they may have lived at the time. The City of Geelong Records office could not help with its location when asked. TENDERS will be received until noon of Saturday the 25th instant, from parties willing to contract for the erection of a timber bridge over Taylor’s River, Mount Elephant, on the road from Geelong to Port Fairy. Tenders to be endorsed “Tender for Bridge over Taylor’s River,” and deposited in the box marked ” Tenders for Works and Stores,” at the western entrance of the Government Offices. Plan and specification can be seen,and every information obtained at the undermentioned office. The Government will not necessarily accept the lowest tender. By order of His Honor the Superintendent. Bridge Office, Melbourne, l4th August, 1849. In 1853 Andrew is registered in the Geelong City Rates Book as being a splitter residing in Little Malop Street Geelong. The residence is described as a four roomed brick dwelling with a shed, the next year 1854 it was described in the same manner but in Little Malop street north Geelong.. Today it is occupied by the City of Geelong Offices and was about where we gathered our information. The records of 1855 list them as living in a weatherboard house with 4 rooms and a kitchen in Britannia Street West. In other records held in the Geelong Heritage centre it shows a partnership between Andrew (a splitter) and George Palmer being dissolved on the 13th February 1846. 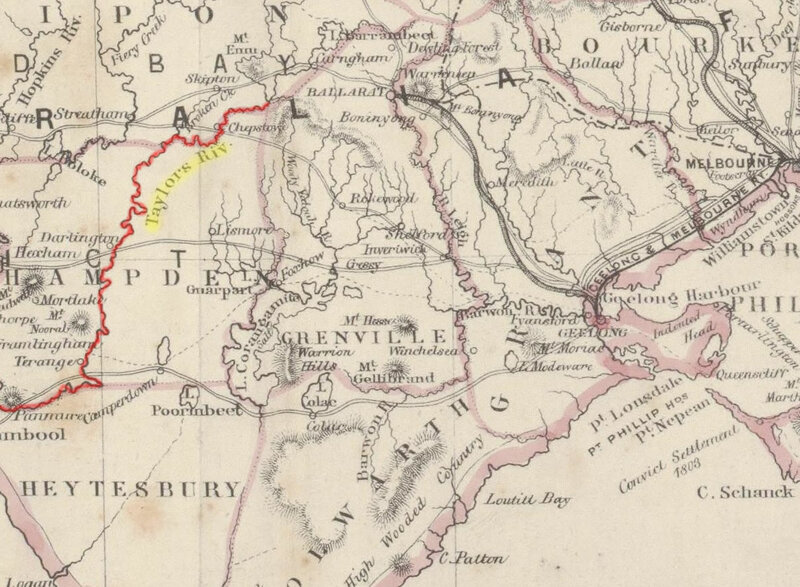 Research of history around that time reveals following the drought in 1837 – 1838 some adventuring settlers trecked inland from Geelong looking for water and on reaching Mount Buninyong decided there was sufficient water around the area for farming. Ballarat was founded by two squatters Anderson and Yuille settling their flocks near what is now known as Lake Wendouree. It became a tranquil peaceful growing town with lots of new arrivals heading inland for the fresh water. This was all shattered with the discovery of gold in August of 1851. By the end of the year there were 1,000 diggers working the area and by the time the Harpers arrived in 1854 the population had grown to 20,000. Life was not kind to either Andrew or Maria as both of them died in tragic circumstances. Maria died at the age of 46 years when her clothing caught fire. The coroner held an inquest into her death at the Dean Hotel Bullarook. His verdict was that Maria had been in poor health and had burned to death after her clothing caught fire in her hut between 12 noon and 3 o’clock on Saturday. 23 Jul 1859. Through hearsay I have been told her husband and sons were returning from cutting timber to learn of the tragedy. 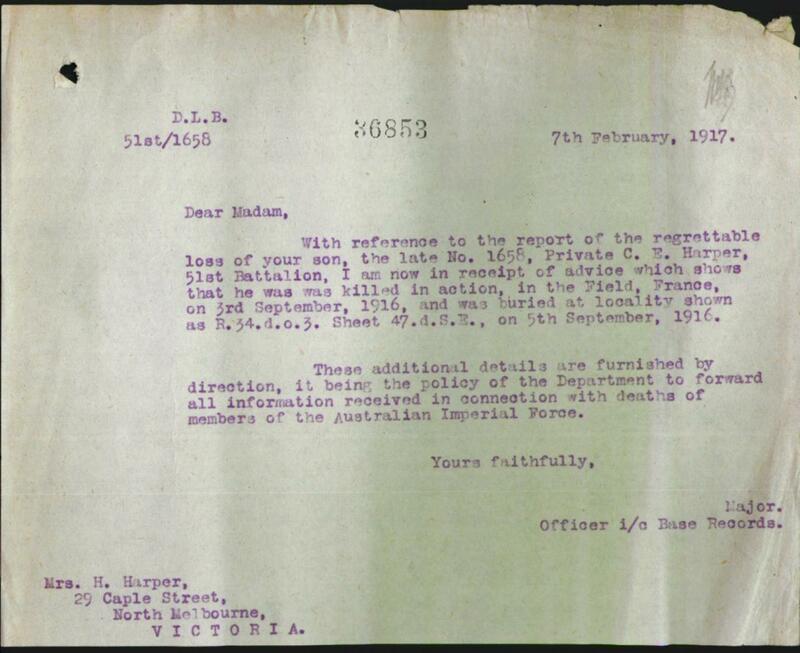 Information was received from Creswick on Saturday, by the Superintendent of police, that a woman named Maria Harper had been found, by her son Henry Harper, burned to death in her own tent at Bullarook, near Harvey’s Hotel. An inquest on the body will be held this day, when the full particulars of this melancholy affair will no doubt be brought to light. Andrew continued to live around Ballarat until his death on 1 June 1882. In a Police statement he was described as a wheelwright, and had no known relatives living in the area at the time of his death. It was believed that his children had all moved away and he stayed intermittently at the “Carriers Arms Hotel” on Creswick Rd, Ballarat. The Publican Michael Carrol in a statement to the coroner stated Andrew had been staying there on and off for the last two years, and continually for the last six months. He told how Andrew who looked in good health and sober was sitting at a table having his tea around 6pm. He sat down with him and after few minutes he noticed Andrew started to look sick and trying to vomit. Another guest suggested that he might be choking and they struck him between the shoulder blades to try and dislodge what ever it was. Having no success he sent the servant girl for the doctor, when the doctor arrived he pronounced Andrew dead. A coronial enquiry subsequently found after an autopsy Andrew had died from a piece of gristle and bone being impacted in his trachea. Andrew had choked to death. Both Andrew and Maria were laid to rest in the Creswick cemetery. It was in Ballarat that our great grand father Samuel Harper met and married Hanorah Ryan at St Alipius Catholic Church on the 25th November 1865. Samuel would have had to convert to Catholicism to win her hand, which was a common practice in those days. They remained around Ballarat for a period of time as the first three children are registered as having been born at Bungaree before they shifted to Riddells Creek where they appear to have settled. Hanorah Ryan was born June 1846 in Kilbane County Clare Ireland she arrived with her family in Melbourne when she was 7 or 8 years of age. Hanorah could not read or write and what was normal for girls in those days was employed taking care of the house. It is interesting to note that her sister Mary Ann Ryan who was about 18 years old witnessed Hanorah’s marriage to Samuel signing her own name while Hanorah used her mark (X), John Harper signed with an X also. Hanorah died of stomach cancer and heart failure on 22 June 1929 aged 85 years. Her death certificate shows her place of death as 29 Simpson St, Jolimont and her usual address 9 Mulberry St, Richmond. She is buried at Riddells Creek with her husband Samuel and two children Sarah Ann and Christopher (KIA in France). The headstone Inscription reads – SACRED to the memory of SAMUEL beloved husband of HONORA HARPER . Died 14 November 1902 aged 67 years. Also their beloved children Sarah died 13th February 1899 aged 27 years and Christopher Harper killed in action France 3rd September 1916 Aged 27 years. The deceased was my husband and he was aged about fifty five years. He was a drunkard and a bad head to her family – I was in Ballarat on last Saturday but I stopped that night at Mull Ryan’s on the Eureka. The deceased came to Mull Ryan’s on last Sunday about four o’clock and he promised Wm Ryan that he would not lay hands on me and I then left with him for home. Immediately after and on our way we met a stout dear man who knew my husband but I did not know him. As my husband was then going to beat me- the man asked deceased to go home quietly – and immediately after he began beating me. It was then about seven o’clock after that he tore all the clothes off me. (crossed out) I and sighted my husband for the last time about a hundred yards below the Victoria Hotel. I then went home – on my way home I noticed that deceased was jolly and getting worse as he came along but when I left him he was well able to walk and run and take care of himself. Deceased has been cross & cranky when he drank living the last three years than before – and more especially the last two months. Deceased fell into a water hole near our hut at night time and would have been drowned if I had not taken after him .affected by my little children – the eldest between home on Sunday night and I went on Monday into Ballarat and enquired after his acquaintences but could not find him. I went again on Tuesday and enquired of him. R? for the deceased I went in the quarry hole there yesterday but I could not see him – my husband called the man whom we met on the road “John Ryan”. Dr Glendinning held an inquest on Saturday at the Victoria Hotel, Warrenheip, on the body of Patrick Ryan, blacksmith, aged 55 years. The evidence of his wife was to the effect that he was a drunkard and a bad head to his family. On Sunday 16th inst at seven pm he was beating her while on the road home, and tore all the clothes off her, and then she got away from him, and parted from him near the hotel at which time though drunk he was able to take care of himself. Mr McLean the landlord deposed to serving him with drink the same night though he appeared to have had a good deal of liquor. This was the last time he was seen alive and on Saturday he was found by some railway laborers floating face downwards in a quarry hole about half way between the hotel and his own hut. The jury returned a verdict – “That death took place on 16th inst. and was caused as we believe by drowning from his having accidentally fallen into a large water hole on his way home in a state of intoxication on same day and we further consider that the railway contractors should be required to fence round the said water hole”.